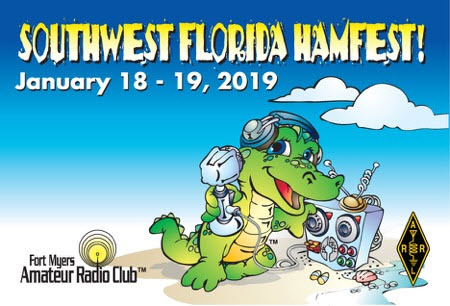 The Fort Myers Amateur Radio Club (FMARC) will present the FMARC Southwest Florida Hamfest on January 18th and 19th at the Riverside Church of Fort Myers, Florida. General Admission is $5 in advance, and $7 at the door. Age 12 and under Free with a adult. The Hamfest operates from Noon to 5 PM on Friday, and from 8 AM to 3 PM on Saturday. Doors will open for setup on Friday at 8 AM, and on Saturday at 6 AM. Swap tables are available at $15 each. Tailgating will be available for $5 per designated parking space on a first-come, first-serve basis. A floor plan and reservation request form are available here: Vendor Registration. Please visit swflhamfest.info for the most up-to-date information.